It’s been exactly one week since the Kopano Conference 2017 at the beautiful stadsvilla Sonsbeek in Arnhem took place. And what a conference it was. All members of Kopano’s ecosystem, including the thought leaders of our recent new collaboration partners came together to exchange visions and ideas. The diversity of the group added extra color to Kopano’s recent announcements and collaboration product portfolio. Simon Phipps, president of the Open Source Initiative and director of The Document Foundation opened the conference with a presentation about Innovation Driven by Open Source. 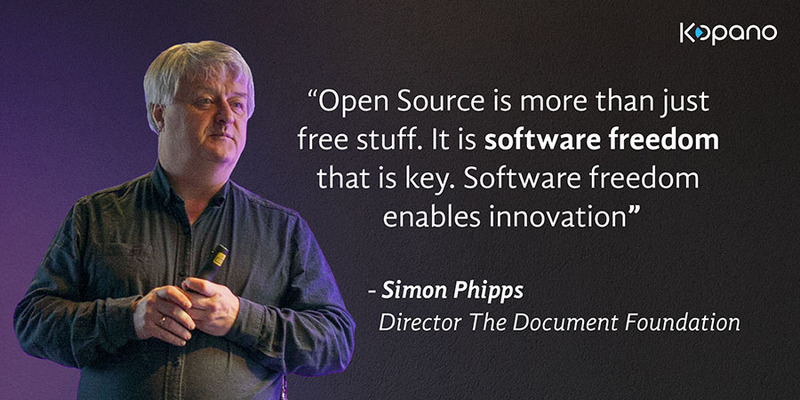 Phipps explained that Open Source is more than just “free stuff”. Rather, the way software freedom enables innovation is by the open source license which allows you to use, modify, change and share code without needing permission. As a result, organizations can use and try applications more easily, and are not held back by high purchase prices and long negotiation processes. Simon closed his presentation with the announcement that The Document Foundation has welcomed Kopano as it newest Advisory Board Member. Niall McCarthy, CEO of Emerge Open, spoke about ChatOps, Enterprise Message Silos and the Birth of the Human Centric Internet. ChatOps help you and your teams increase productivity by delivering real-time chat in team-based communication channels. It provides the ability to share information, files and content from dozens of your commonly used business applications instantly. Over the last 30 years we have seen enormous growth in ChatOps applications. McCarthy attributes this growth in part to the demand in enterprise openness and joined up technology ecosystems. We are used to working in silos, but there is a strong need for disconnecting these silos. ChatOps facilitate new, silo-less ways of working that focus on collaboration. Then of course, there is the human aspect. The number of applications we use one a daily basis keeps growing. But how many interfaces can we handle? What we want is human-centric internet, a single messaging interface. Cloud applications like Slack are offering this, however, they do not and cannot guarantee data protection and privacy. That’s why, according to McCarthy, the long-term ChatOps champion will not be a cloud service, but an open source, self-hosted offering. Kopano CEO Brain Joseph started his presentation with the introduction of the new Kopano motto: “Augmenting Teamwork”. He stated that if we, as humans, want to get the most out of our evolution, we need to make a huge step in our digital evolution. The way Kopano contributes to this evolution is by providing intuitive, digital tools that enhance collaboration and improve communication. To deliver these tools, Kopano has extended its product portfolio including integrations with LibreOffice Online and Mattermost. Free software like Kopano is getting even more relevant with the forthcoming new data protection laws. The GDPR provides a unique opportunity for self-hosted applications that allow teams to collaborate in an intuitive way. Lunch at the Kopano Conference was all about winning a trip to LibOCon in Rome. 5-player teams competed in 5 short games – bowling, football, archery, horse shoe throwing and Pictionary. The winning team was announced at the end of the day where the individual team members had to answer one question: “How many lines of code are there in the (latest version of) the Linux kernel”. The competitor who called the number closest to the answer was Boris of Campai who was obviously very happy! The afternoon was dedicated to several shorter sessions and workshops, like the 40-minute sessions about data protection by ICT & Recht, CRM forking by SuiteCRM, SMB opportunities with Univention and Clear OS and a session about the Kopano Clients. Workshops that participants could join were the theming workshops and a workshop about Python. The closing sessions were centered around the future of Kopano. Simon Eisenmann and Helmuth Neuberger discussed Open ID Connect and the magic behind it. Bob Huisman, Mikael Kromer, Simon Eisenmann and Sean van der Spek presented what’s next for Kopano, like certificate handling and support in S/MIME, ChatOps integrated with Kopano & your tools, the integration of Web Meetings in Mattermost and the public availability of LibreOffice Online packages. To learn more about what’s next for Kopano, check out the latest version of our Strategy & Roadmap Document. All and all it was a great conference, made possible by a great group of people, and of course, our sponsors and community. A big thanks to all! We couldn’t have done this without you.